This week, in addition to drawing from last year's list and a few of Charlotte's ideas, I'll be adding some of the upcoming feast days into our activities as well. Listen to Oh What a Beautiful City. Since the above song mentions "twelve gates," one named for each of the apostles, you could read about the apostles! We will probably read The Twelve Apostles by Marianna Mayer and/or Apostles of Jesus by Father Lovasik. Color the Gates into Heaven Coloring Page. Give the children their own Pretzel and Cheese Cube Construction Kit to build their own gates. Hand paint Stained Glass Cross Shaped Suncatchers. Listen to the Hallelujah Chorus from Handel's "Messiah" as well as The Story Of Handel . I loved Charlotte's idea of watching The Chronicles of Narnia - The Lion, the Witch and the Wardrobe! Since this Thursday is the feast of the Ascension, we will attend Mass and then head to a nearby hilltop for an Ascension Picnic. Show the children some of our wedding pictures! Celebrate the feast of St. Rita of Cascia with a simple tea in her honor. Make Tuxedo Brownie Cups, Cookies, or Strawberries. Call Father and wish him a Happy 5th Anniversary!! Place a crown of flowers on our statue of Mary. This year, May 23rd is the traditional feast of Mary, Queen of the Apostles. 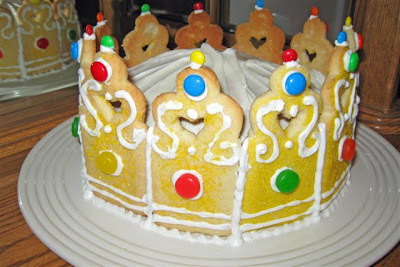 Perhaps we will make another Crown Cake or at least some Simple Cupcake Crowns.